29 years, 8 months, 4 days old age. 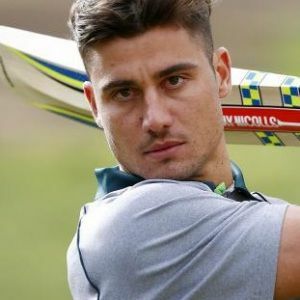 Marcus Stoinis will turn 30 on 16 August, 2019. Only 3 months, 26 days, 21 hours, 18 minutes has left for his next birthday. Marcus Stoinis has celebrated the total number of 29 birthdays till date. See the analysis by days count and bar graph. Marcus Stoinis was born on 16-08-1989 in Perth, Western Australia, Australia. He is an Australian Cricket Player. Marcus is an explosive batsman and a more than handy medium pacer bowler. He was included in the Australian team that participated in the 2008 ICC Under-19 World Cup held in Kuala Lumpur, Malaysia. Players like Phil Hughes, Steven Smith, Josh Hazlewood, James Pattinson, and James Faulkner were his team-mates. Soon after he returned, he made his first-class debut for Western Australia in the Australian domestic season of 2009-10. Though, he didn’t get many chances and soon shifted to Victoria where he has been a regular fixture since then. After playing 4 first class seasons, he finally came of age in the 2014/15 Sheffield Shield tournament. He scored 785 runs at a healthy average of 49.06 during the season. After such a wonderful first-class season, he has inducted in Australia A side that toured India for a triangular series between India, Australia, and South Africa. After some prolific run-making in the Big Bash League for the Melbourne Stars, he was finally included in the national squad for the One Day Internationals and the only T20I against England in 2015. Marcus Stoinis was already making the buzz before the 2016 IPL player auctions and was finally roped in by the IPL side Kings XI Punjab. He was the only bright light in the dismal season for Kings XI Punjab that season. He took eight wickets and topped it up with 146 runs in five innings. He couldn’t do much though in the IPL 2017 as he hardly got any chances. He was born to Chris Stoinis and has a sister named Natasa. His big-hitting prowess saw him selected to play for Australia in the 2009 edition of the Hong Kong Super Sixes. Marcus Stoinis made his IPL debut in the 2016 edition of the Indian Premier League. He smashed a wonderful 33 off just 20 odd deliveries to help the Kings to a defendable target of 161. However, he conceded 27 runs in his 2 overs without picking up a wicket. Stoinis partnered the former Sri Lankan skipper Sanath Jayasuriya in a charity match which took place between World XI against Nepal. He proved his mettle with the willow in hand at the Kinrara Academy Oval in Kuala Lumpur as he stroked 48 runs off 29 balls in the T20 match.